It always amazes me that Harry Potter screenwriters manage to condense J.K. Rowling's voluminous works into a 2.5 hr long movie. 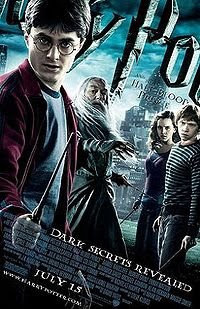 Harry Potter and the Half-Blood Prince is probably the funniest of all the films so far, even as it delves deeper into the ever-darkening wizarding world. The cinematography is top-notch, gloomy and atmospheric to reflect a world at war. The opening scenes are chilling to watch; in this war, Muggles are collateral damage. The cast members have fully evolved their characters at this point in the franchise. Tom Felton's stylish Draco (I call him Corporate Draco) for once has lost his arrogance, bedeviled by the responsibilities the Death Eaters have thrust upon him. The incomparable Jim Broadbent is Professor Slughorn, who cuts a tragic figure, haunted by his memories and actions. Even Alan Rickman's Professor Snape looks appropriately exhausted and tormented, although he keeps it below the surface. Luna (Evanna Lynch) is more eccentric than ever. Lavender Brown wasn't as annoying as I thought she'd be (kudos to the young actress Jessie Cave). Much credit also to the young actors who played Tom Riddle: Hero Fiennes-Tiffin (Ralph Fiennes's nephew) and Frank Dillane. Creepy kids always terrify the bejesus out of me. I'm not a fan of Quidditch, but I enjoyed the Quidditch scenes in this movie. Viewers beware: despite the comedy and action, the film is scary. The scene of Katie Bell (Georgina Leonidas) in Hogsmeade is embedded in my retina. I jumped out of my seat during the lake scene. (By the way, I was impressed at how the lake sequences were expeditiously handled). And of course, the infamous book ending was quiet and dignified in the film. Although I think the decision to make Deathly Hallows into two films was borne out of greed, I'm pretty sure I'll be lining up to watch those two movies come opening day. See you back at the Potterverse in 2010 and 2011!